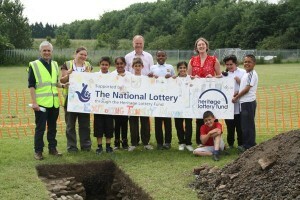 In 2012, Wessex Archaeology in partnership with Heeley City Farm was awarded a sum of money from the Heritage Lottery Fund to commence a three-year excavation project on the Tinsley Meadows site (formerly Tinsley Junior School). The team bid for monies to support an excavation to explore the possibility of uncovering a medieval Manor House which was thought to be present underneath our school field! The ‘Old Manor House’ farm was demolished in the 1960’s to make way for the new school build. The first season was a great success with the children learning about archaeology for the first time. They have explored the history of the local area, taken part in archive research, map regression, geophysical survey, test-trenching and finds processing. The project is also engaging the community through a volunteer group focusing on archival research and collating oral histories, but also training in survey techniques. The local history society, church coffee morning group, local library and community forum have been spreading the word, collecting old photographs and memories. At the end of the summer of 2013, four trenches were located on the school playing fields in relation to the results of map regression and resistivity survey and three revealed stone and brick foundations and surfaces. The Year 5s converted their classroom into a site hut for the duration of the fieldwork. The site was open to the whole school community and visitors included the local history group, parents, school governors, the local press and the Sheffield South East MP Clive Betts who called in to check on progress. Finds recovered from the trenches included a sherd of medieval 12th to 15th century pottery along with post-medieval pottery, clay tobacco pipe, glass, brick, slate and animal bone. The project is now into it’s third and final year and we are working closely with Wessex Archaeology and Heeley City Farm to explore options to safeguard the legacy of the Manor House and Tinsley’s interesting history. V roku 2012 , Wessex archeológie v spolupráci s Heeley City Farm získal sumu peňazí od Heritage loterijního fondu začať trojročný výkopové projekt na mieste Tinsley Meadows ( predtým Tinsley Junior School ) . Tím ponuka pre prostriedkov na podporu výkop , aby preskúmala možnosť odkrytie stredoveké Manor House , ktorý bol myšlienka byť prítomný pod našou školské ihrisko ! ” Old Manor House ‘ statok bol zbúraný v roku 1960 robiť cestu pre nový školský verziu .